I love Emma Hart rom-coms. There is something about her books that have the perfect amount of snark. Raelynn has the perfect of snark that I needed as a reader. The characters and the ice cream shop were great in this story, but the plot overall was lacking for me. It seemed forced in a way. Raelynn’s character was good and I loved seeing her ice cream creations, but the overall plot just didn’t do it for me. Had the plot been a little different, my interest would have held a little longer. The characters were true to Emma form and had me laughing out loud and loving the comedy and I can’t wait for another book, this one just wasn’t my favorite. Funny, feel good, snarky read. This romcom is fun, funny and snarky. I thoroughly enjoyed it and laughed a lot as I read it. I really loved it. Raelynn and Chase...sigh, they needed to communicate better. But then if they did we wouldn’t have had this great book! He opened her dream, or so she thought, ice cream parlor, using her ideas. She wants to deliver him payback with a spoon and out of business sign on top. Their adventures in discovering their past, present and future we leave you in a happy, smiling place! 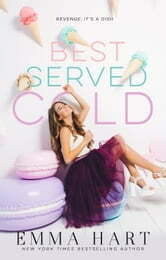 Best Served Cold was a good story about ex lovers Rae and Chase! They haven’t spoken in two years since the split when Rae broke up with him and he opened his own ice cream shop! We come to learn why he did what he did and how Rae can overcome that and revamp her own shop! I liked the banter and the friendships in this story. I smiled in parts and laughed in others and I was certainly hoping for a hea as I rather liked Rae, she deserves one after her dramas. She was rather accident prone and it was quite funny the things that happened. I promise im laughing with her not at her! I really liked how this book ended and I loved how the real sense of family became even better!! First off I need to say this is one of the cutest covers I have ever seen! Raelynn is so sassy and I love her humor. Chase and give right back as good as he gets from her and I loved the sarcastic banter between them. I really liked their unique story with their stores and their history. I understood both of their feelings and in different ways I understand their actions. I really liked seeing them journey from enemies to lovers...again! They have such chemistry and fit together so well it's hard to deny. I really felt for both of them and what was going on. Chase is really sweet inside and I love his heart. I wanted to root for Raelynn so much. She is in a really tough spot and she is so creative and works so hard to get what she wants. She is quite stubborn with Chase and I can't say I blame her. They have a really fun slow burn. I was so entertained with this book and just adored it!